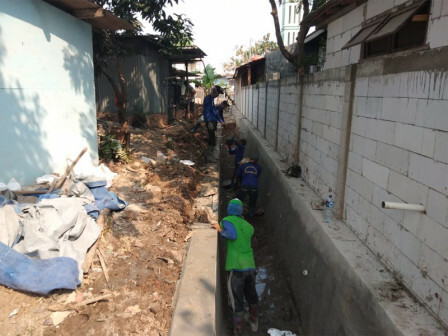 Connecting (PHB) channel retaining wall repair progress on Jalan Prihatin, Kelapa Gading Barat Urban Village, Kelapa Gading, North Jakarta, has reached 70 percent.
" We repair it before it becomes severe which can trigger road to collapse"
Kelapa Gading Sub-district Water Resources Unit Head (Satpel), Rukmana said, repair has been started since August. Retaining wall is repaired due to land subsidence and collapsing on several parts. "We repair it before it becomes severe which can trigger road to collapse. We start its repair from August 9," he mentioned, Tuesday (8/28). He explained, retaining wall that has 0.60 meters wide and 1.2 meters high is repaired using river stone and strengthen around 85 meters long horizontal and vertical slopes which are damaged. "Current progress has reached 70 percent. Hopefully it can be finished this weekend," he conveyed.